If we talk about bees, the first thing that comes to mind might be the picture of a well-structured colony of insects flying around a honeycomb made of perfectly constructed wax cells full of honey. But the truth is that not all bees known nowadays live in hierarchical communities and make honey. Actually, most species of bees develop into a solitary life-form unlike the classical and well-known honey bees (which are so appreciated in beekeeping). Through this article, I’ll try to sum up the different life-forms of bees in order to shed light on this issue. Bees are a large diverse group of insects in Hymenoptera order, which also includes wasps and ants. To date, there are up to 20,000 species of bees known worldwide, although there could be more unidentified species. They can be found in most habitats with flowering plants located in every continent of the world (except for the Antarctica). Bees pick up pollen and nectar from flowers to feed themselves and their larvae. Thanks to this, they contribute on boosting the pollination of plants. Thus, these insects have an enormous ecological interest because they contribute to maintain and even to enhance flowering plant biodiversity on their habitats. However, even though the way they feed and the sources of food they share could be similar, there exist different life-forms among bees which are interesting to focus on. Most species of bees worldwide, contrary to the common knowledge, develop into a solitary life-form: they born and grow alone, they mate once when groups of male and female bees meet each other and, finally, they die alone too. Some solitary bees live in groups, but they never cooperate with each other. Female of solitary life-form bees build a nest without the help of other bees. Normally, this kind of nest is composed by one or more cells, which are usually separated by partition walls made of different materials (clay, chewed vegetal material, cut leaves…). Then, they provide these cells with pollen and nectar (the perfect food for larvae) and, finally, they lay their eggs inside each cell (normally one per cell). Contrary to hives, these nests are often difficult to find and to identify with naked eyes because of its discreetness. Solitary bee nest. In this picture we can see the partition walls, pollen and eggs inside each cell (Picture from USDA). The place where solitary bees build their nest is highly variable: underground, inside twisted leaves, inside empty snail shells or even inside pre-established cavities made by human or left behind by other animals. These bees don’t make hives nor honey, so these are probably the main reasons because of what they are less popular than honey bees (Apis mellifera). Although solitary bees are the major contributors on pollination due to their abundance and diversity (some of them are even exclusive pollinators of a unique plant species, which reveals a close relation between both organisms), most of the studies related with bees are focused on honey bees, because of what studies and protection of these solitary life-forms still remain in the background. 1) Specimen of Andrena sp. (Picture by kliton hysa on Flickr). 2) Specimen of Xylocopa violacea or violet carpenter bee (Picture by Nora Caracci fotomie2009 on Flickr). 3) Specimen of Anthidium sp. (Picture by Rosa Gambóias on Flickr). 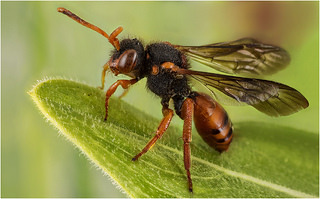 There are also parasite life-forms among solitary bees, that is, organisms that benefit at the expense of another organism, the host; as a result, the host is damaged in some way. Parasitic bees take advantage of other insects’ resources and even resources from other bees causing them some kind of damage. This is the case of Nomada sp. genus, whose species lay their eggs inside other bee nests (that is, their hosts), so when they hatch, parasite larvae will eat the host’s resources (usually pollen and nectar) leaving them without food. Scientists named this kind of parasitism as cleptoparasitism (literally, parasitism by theft) because parasitic larvae steal food resources from the host larvae. From now on, we are going to stop talking about solitary bees and begin to introduce the pseudosocial life-forms, that is, bees that live in relatively organized and hierarchical groups which are less complex than truly social life-forms, also known as eusocial life-forms (which is the case of Apis mellifera). 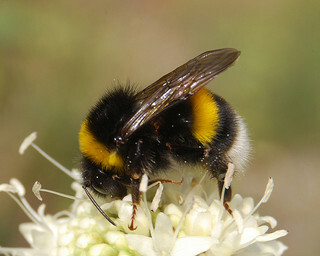 Probably, the most famous example is the bumblebee (Bombus sp.). These bees live in colonies in which the queen or queens (also known as fertilized females) are the ones who survive through the winter. Thus, the rest of the colony dies due to cold. So is thanks to the queen (or queens) that the colony can arise again the next spring. Specimen of Bombus terrestris or buff-tailed bumblebee(Picture by Le pot-ager "Je suis Charlie" on Flickr). Finally, the most evolved bees known nowadays in terms of social structure complexity are eusocial bees or truly social bees. Scientist have identified only one case of eusocial bee: the honey bee or Apis mellifera. 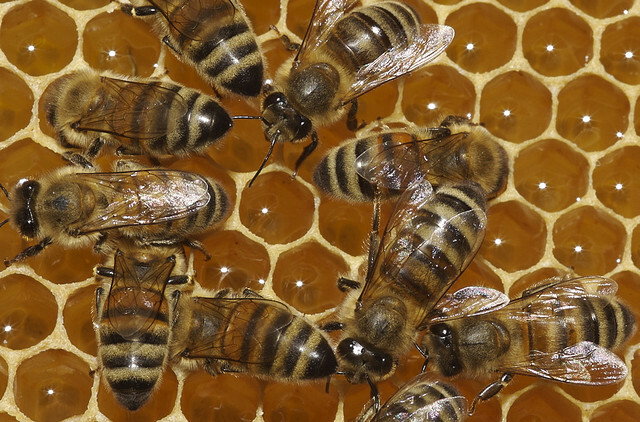 Since the objective of this article was to refute the “all bees live in colonies, build hives and make honey” myth, I will not explain further than the fact these organisms form complex and hierarchical societies (this constitutes a strange phenomenon which has also been observed in thermites and ants) normally led by a single queen, build large hives formed of honeycombs made of wax, and make honey, a very energetic substance highly appreciated by humans. Specimens of Apis mellifera on a honeycomb full of honey (Picture by Nicolas Vereecken on Flickr). As we have been seeing, solitary bees play an important role in terms of pollination, because of what they must be more protected than they currently are. However, honeybees, and not solitary bees, still remain being on the spotlight of most scientists and a great part of society because of the direct resources they provide to humans. Notes taken during my college practices at CREAF (Centre de Recerca Ecològica i d’Aplicacions Forestals – Ecological Research and Forest Applications Centre). Environmental Biology degree, UAB (Universitat Autònoma de Barcelona). Pfiffner L., Müller A. (2014) Wild bees and pollination. Research Institute of Organic Agriculture FiBL (Switzerland). If you liked this article, feel free to share it at different Social Networks. Your collaboration allows science and nature information to spread throught different media and guarantee more peolpe could enjoy it! Lo más seguro es que, al pensar en una abeja, venga a tu mente la imagen de una colonia de insectos bien organizada, al amparo de un panal formado por celdas de cera perfectamente delimitadas y repletas de miel. Pero la verdad es que no todas las abejas que se conocen a día de hoy se organizan en sociedades jerarquizadas ni todas ellas fabrican miel, al contrario: la mayoría de especies del mundo desarrollan hábitos de vida solitarios totalmente contrarios a la imagen clásica de la abeja de la miel tan apreciada en apicultura. En este artículo, trataré de resumir las distintas formas de vida observadas en las abejas con el fin de arrojar un poco de luz a este asunto. Las abejas constituyen un grupo muy diverso de insectos dentro del orden de los Himenópteros, en el cual también encontramos a las avispas y a las hormigas. A día de hoy se conocen acerca de 20.000 especies de abejas en todo el mundo, aunque se cree que podría haber muchas más sin clasificar. Su distribución es casi planetaria, pues a excepción de la Antártida se pueden encontrar en todos los continentes del mundo y en casi todos aquellos hábitats que contengan plantas con flores. Las abejas tienen un gran interés ecológico ya que, al margen de sus distintas formas de vida, prácticamente todas viajan de flor en flor recogiendo néctar y polen para alimentarse ellas mismas y a sus larvas, lo que a su vez propicia el fenómeno de la polinización; así, su actividad contribuye a la biodiversidad floral de la zona. Ahora bien, aunque en general compartan el hecho de alimentarse de néctar y polen, no todas las especies de abejas viven de la misma forma. La mayoría de especies de abejas a escala mundial, al contrario de lo que se suele pensar, son solitarias: nacen y se desarrollan solas, se reproducen en un momento muy concreto de su vida al encontrarse grupos de machos y hembras y, finalmente, mueren solas. Algunas viven en grupos, pero en ningún caso cooperan entre ellas. En las formas solitarias, son las hembras quienes construyen sin ayuda de otras abejas un nido generalmente formado por una o varias celdas separadas por tabiques de diferentes materiales (barro, material vegetal masticado, hojas, etc. ); posteriormente, proveen estas celdas con polen y néctar (el alimento perfecto para las larvas) para, finalmente, depositar en ellas los huevos. Estos nidos, a diferencia de las tan conocidas colmenas, suelen ser muy discretos, por lo que rara vez se reconocen a simple vista. Nido de abeja solitaria; se aprecian los tabiques, el polen y los huevos dentro de cada celda (Foto de USDA). El lugar donde las abejas solitarias construyen sus nidos es muy variable: bajo tierra, en el interior de hojas retorcidas o de caparazones de caracol vacíos o, incluso, dentro de cavidades preestablecidas (artificiales o construidas y abandonadas por otros animales). Estas abejas no se desarrollan juntas en colmenas formando enjambres ni fabrican miel, los cuales, posiblemente, son los motivos principales por los que gozan de menos fama que la abeja de la miel o Apis mellifera, la cual sí vive en colmenas. La mayoría de estudios sobre abejas se centran en esta especie, dejando en segundo plano el estudio y protección de las formas de vida solitarias, aun siendo éstas las mayores contribuyentes a la polinización debido a su gran número y diversidad; algunas, incluso, son polinizadoras exclusivas de una única especie de planta, revelando una estrecha relación entre ambos organismos. 1) Ejemplar de Andrena sp. (Foto de kliton hysa en Flickr). 2) Ejemplar de Xylocopa violacea, el abejorro carpintero europeo (Foto de Nora Caracci fotomie2009 a Flickr). 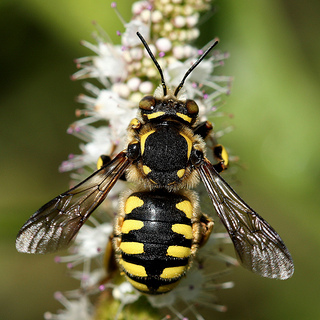 3) Ejemplar de Anthidium sp. (Foto de Rosa Gambóias a Flickr). Dentro de las abejas solitarias también existen formas parásitas: abejas que se benefician a expensas de otros insectos (e incluso de otras abejas), esto es, los hospedadores, causándoles un daño. Este es el caso del género Nomada sp., cuyas especies depositan los huevos en el interior de los nidos de otras abejas; al eclosionar, las larvas parásitas se alimentan del néctar y el polen del nido que parasitan, dejando a la abeja hospedadora sin recursos. Este tipo de parasitismo en concreto se conoce como cleptoparasitismo (klepto = robar), puesto que las larvas parásitas literalmente roban el alimento de las larvas de la especie hospedadora. Dejamos de lado las formas solitarias y, avanzando en complejidad, encontramos las formas pseudosociales: abejas que forman grupos relativamente organizados y jerarquizados pero sin llegar al nivel de formas verdaderamente sociales, como es el caso de Apis mellifera. Posiblemente, el ejemplo más famoso es el del abejorro (Bombus sp.). Estas abejas forman colonias en las que la o las reinas (hembras fecundadas) son los únicos ejemplares que sobreviven al invierno; el resto, muere debido al frío. Gracias a ellas, las colonias vuelven a reconstruirse a la primavera siguiente. Ejemplar de Bombus terrestris o abejorro común  (Foto de Le pot-ager "Je suis Charlie" en Flickr). Finalmente, las abejas más evolucionadas en lo que a complejidad de su estructura social se refiere son las abejas eusociales o verdaderamente sociales. El único caso reconocido hasta la fecha es el de la abeja de la miel o Apis mellifera. Dado que el objetivo de mi artículo era desmentir el mito de que “todas las abejas forman colonias, construyen colmenas y fabrican miel”, no ahondaré más allá del hecho que estas abejas forman complejas estructuras sociales jerarquizadas (un fenómeno muy raro, también observado en termitas y hormigas) lideradas normalmente por una única reina, construyen grandes colmenas formadas por panales de cera y producen miel, un producto de gran contenido calórico muy apreciado por el ser humano. Ejemplares de Apis mellifera sobre un panal lleno de miel (Foto de Nicolas Vereecken en Flickr). Como se ha visto, las abejas solitarias juegan un papel de vital importancia en términos de polinización, por lo que deberían estar mucho más protegidas. En cambio, siguen siendo las abejas de la miel quienes se llevan la mayor parte de la atención debido a los recursos directos que éstas aportan al ser humano. Apuntes y memoria personales de las prácticas académicas del grado en Biología Ambiental realizadas en el curso 2013-2014 en el CREAF (Centre de Recerca Ecològica i Aplicacions Forestals). Universitat Autònoma de Barcelona. O’toole, C. & Raw A. (1999) Bees of the world. Ed Blandford. De ben segur que, en pensar en una abella, et vingui al cap la imatge d’una colònia d’insectes molt ben organitzada, voleiant al voltant d’una bresca formada per cel·les de cera ben delimitades i plenes de mel. Però el cert és que no totes les abelles de les que es té coneixement avui en dia s’organitzen en societats jerarquitzades ni totes elles fabriquen mel. Tot el contrari: la major part de les espècies desenvolupen formes de vida solitàries totalment contràries a la imatge clàssica de l’abella de la mel, tan apreciada pels apicultors. Al llarg d’aquest article, tractaré de resumir les diferents formes de vida de les abelles amb la finalitat d’esclarir una mica tot aquest assumpte. Les abelles configuren un grup d’insectes molt divers dins l’ordre dels Himenòpters, el qual també inclou les vespes i les formigues. Avui en dia es coneixen al voltant de 20.000 espècies d’abelles arreu del món, encara que es sospita que n’hi podria haver moltes més sense classificar. La seva distribució és quasi planetària, doncs a excepció de l’Antàrtida es poden trobar en tots els continents del món i pràcticament en tots aquells hàbitats on hi creixen plantes amb flors. Les abelles tenen un gran interès ecològic ja que, al marge de presentar diferents formes de vida, gairebé totes viatgen de flor en flor recollint nèctar i pol·len per nodrir-se tant elles com a les seves larves, el que al seu torn propicia el fenomen de la pol·linització; així doncs, la seva activitat contribueix a potenciar la biodiversitat floral de la zona. Ara bé, encara que en general comparteixin una alimentació basada en nèctar i pol·len, no totes les espècies d’abelles desenvolupen els mateixos hàbits de vida. La majoria d’espècies d’abelles a escala mundial, al contrari del que és habitual pensar, són solitàries: neixen i es desenvolupen soles, es reprodueixen en un moment molt concret de la seva vida en trobar-se grups de mascles i femelles i, finalment, moren soles. Si bé es cert que algunes d’aquestes abelles viuen en grups, en cap cas cooperen entre elles com sí ho fan les abelles colonials. En les formes solitàries, són les femelles les que construeixen, sense ajuda de cap altre exemplar, un niu format per una o vàries cel·les separades (o no) per envans de diferents materials (fang, material vegetal mastegat, fulles, etc. ); posteriorment, proveeixen aquestes cel·les amb pol·len i nèctar (l’aliment perfecte per les larves) i, finalment, hi dipositen els ous. Aquests nius, a diferència dels ruscs, tendeixen a ser molt discrets, essent difícils de reconèixer a simple vista. El lloc on les abelles solitàries construeixen el niu és molt variable: sota terra, dins de fulles recargolades, a l’interior de closques de cargol buides o, fins i tot, en cavitats preestablertes (artificials o construïdes i abandonades per altres animals), entre d’altres. Aquestes abelles no es generen massivament a l’interior d’un rusc ni fabriquen mel, essent aquests els motius principals i més probables pels quals gaudeixen de menys fama que l’abella de la mel o Apis mellifera, la qual sí construeix ruscs. La majoria d’estudis relacionats amb abelles es focalitzen en aquesta espècie, deixant en segon pla l’estudi i protecció de les formes de vida solitàries, tot i ser aquestes les majors contribuents a la pol·linització degut al seu elevat número i diversitat; algunes, fins i tot, són pol·linitzadores exclusives d’una única espècie de planta, fet que revela una estreta relació entre ambdós organismes. 3) Exemplar d'Anthidium sp. (Foto de Rosa Gambóias a Flickr). Dins les abelles solitàries també existeixen formes paràsites: abelles que s’aprofiten dels recursos d’altres insectes (fins i tot d’altres abelles), és a dir, dels hostes, causant-los un greuge. Aquest és el cas de les abelles del gènere Nomada sp., les espècies del qual dipositen els ous dins els nius d’altres abelles; en néixer, les larves paràsites s’alimenten del nèctar i el pol·len del niu que parasiten, deixant a les abelles parasitades sense recursos. Aquest tipus concret de parasitisme es coneix com a cleptoparasitisme (klepto = robar), atès que les larves paràsites roben, literalment, l’aliment de les larves de l’espècie hoste. Deixem de banda les formes solitàries i, avançant en complexitat, ens trobem amb les formes pseudosocials: abelles que formen grups relativament organitzats i jerarquitzats, però sense arribar mai a l’alçada de les formes verdaderament socials, com és el cas d’Apis mellifera. Possiblement, l’exemple més famós és el de l’abellot (Bombus sp.). Aquestes abelles formen colònies en les que la o les reines (femelles fecundades) són els únics exemplars que sobreviuen a l’hivern; la resta, mor degut al fred. Gràcies a elles, però, les colònies tornen a revifar durant la primavera següent. Exemplar de Bombus terrestris o borinot (Foto de Le pot-ager "Je suis Charlie" a Flickr). Finalment, les abelles més evolucionades en quan a complexitat de la seva estructura social són les abelles eusocials o verdaderament socials. L’únic cas reconegut avui dia és el de l’abella de la mel o Apis mellifera. Donat que l’objectiu d’aquest article era desmentir el mite que “totes les abelles formen colònies, construeixen ruscs i fabriquen mel”, només diré que aquestes abelles formen complexes estructures socials jerarquitzades (un fenomen molt rar, també observat en tèrmits i formigues) liderades normalment per una única reina, construeixen grans ruscs formats per bresques de cera i produeixen mel, un producte d’elevat contingut calòric molt apreciat per l’ésser humà. 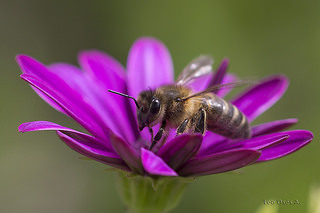 Exemplars d’Apis mellifera sobre una bresca plena de mel (Foto de Nicolas Vereecken a Flickr). Com hem pogut veure, les abelles solitàries juguen un rol vital en termes de pol·linització, motiu pel qual haurien d’estar molt més protegides. En canvi, continuen sent les abelles de la mel les que s’enduen la major part de l’atenció degut, sobretot, als recursos directes que aquestes aporten a l’ésser humà. Apunts i memòria personals de les pràctiques acadèmiques del grau en Biologia Ambiental realitzades al curs 2013-2014 al CREAF (Centre de Recerca Ecològica i Aplicacions Forestals). Universitat Autònoma de Barcelona. Si t’ha agradat aquest article, no dubtis a compartir-lo a través de les xarxes socials per fer-ne difusió. Gràcies a la vostra col·laboració, la divulgació de la ciència i la natura arriba a molta més gent!